Akram is a Principal and the lead Architect for MRT. He has over 25 years experience in architectural project management for both public and private clients. Whether designing new facilities or renovating existing buildings, his focus is to produce design options that provide a balance between the initial construction costs and long-term operating costs. 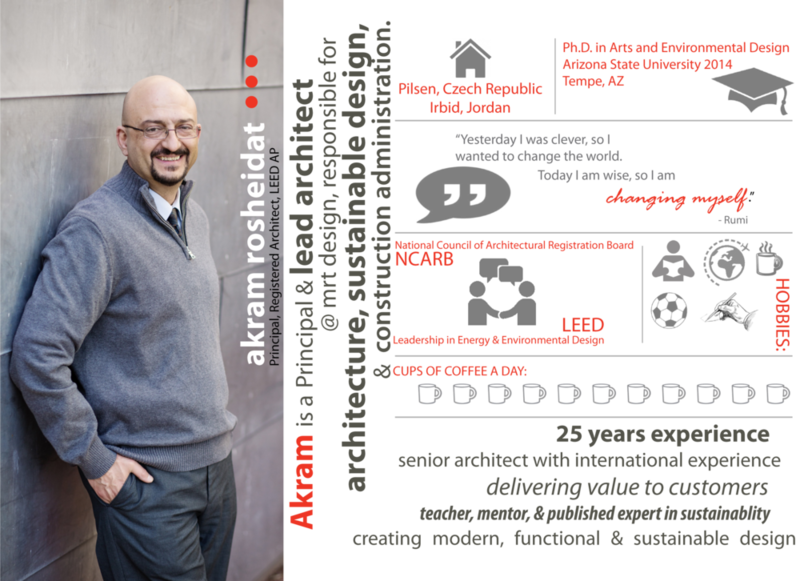 in 2014, Akram was awarded his Ph.D in Environmental Design at ASU. He is an expert in performing the computer simulation studies required to obtain LEED credits, having extensive experience working on projects that utilize renewable energy, passive solar design, and water conservation strategies. Akram has experience with a variety of construction delivery methods and is the AFP registrant for multiple clients. Rosie is President and Certified Facilities Manager. She has more than 30 years of experience in facilities management, strategic planning, master planning, process analysis, alternative office strategies, and project management. She oversees projects ranging from facility audits and master planning to tenant improvements to major rehabilitations. She brings special expertise in helping organizations track, plan, and rapidly respond to changing space, technology, equipment, and business needs. Rosie's experience in delivery methods include traditional design-bid-build, CMAR, and design-build. Jim is a licensed architect and the Director of Architecture at MRT, with over 20 years of experience. He is a LEED Accredited Professional in Building Design and Construction. Jim has extensive experience in a variety of buildings sizes, types, and complexity. Examples include education, corporate office, mixed use, laboratories and healthcare facilities. His forte is delivering a design that is efficient and cost effective. He is motivated by providing excellent customer service and delivering an end product that meets our clients needs. Rhoda is an Architect-In-Training, currently pursuing her architectural license. Having joined the MRT Team in September 2014, her years of experience include retail, tenant improvements of various scales, and residential design & construction. In 2012, she graduated from the Master of Architecture program at Arizona State University. She is highly motivated and her passion for design has brought fresh ideas to the MRT Team. Rhoda is responsible for design, construction documents, code research, client relationships, and coordination with consultants and city officials. Kate is the newest team member, having joined MRT in October 2016. Kate is an Architect-In-Training, working towards being a licensed architect. She works with the Project Manager/Architect in creating the schematic, design development and construction documents for various projects. In 2008, she graduated with a BArch from the University of Arizona. Kate has worked in the design industry for 8 years and is skilled in production, coordination, technical detailing, construction documents, and architectural renderings.